First I Am Dad: Blech! I keep asking myself why I have become the world's laziest blogger. I used to post regularly to my blog. Sometimes the posts were even decent and a lot of the pictures were, I think, pretty damned interesting. Now I might go a month without making a single original post. Some of it is twitter. Some of it is too much time spent consuming the content of others instead of creating my own. Mostly, however, I think it is the poor quality of the camera on my HTC Tilt phone. It is hard to keep taking pictures all the time when they all turn out poorly. These days I really miss my Sony Erricson phone when it comes to picture taking. 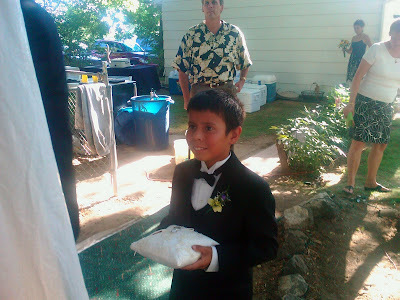 The pic below, taken with the Tilt, is Jacob at his cousin Jenna's wedding. He did a great job as ring bearer and looked pretty dapper doing it.